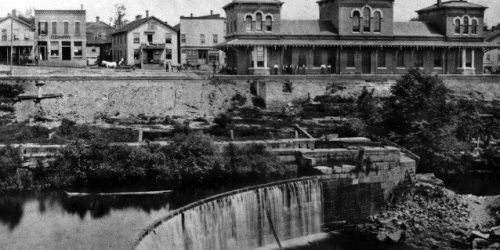 The roaring waters of the Cuyahoga river have always been a focal point to Kent’s history. The Pennsylvania & Ohio canal brought prosperity to Kent. The building of the canal caused a land boom in Franklin Mills during the promising 1830's. Workers who came to Kent during the land boom had to be fed and housed. Many stores opened and thrived. Some of these workers were the canal builders, mainly Irish­ workmen. Construction on the canal began in 1836. They started by building a lock on the east bank of the river just below Main Street. The ca­nal builders also reconstructed a dam across the river to replace the one washed away by the flood of 1832. At the same time, a covered bridge on Main Street was built over the river, now the site of the stone arch bridge. The dam created a slackwater pool above it and the canal locked into the river and used the river as part of the canal since the east bank was solid rock. The canal was finished in 1840 and went to Akron where it connected with the Ohio and Erie canals (Cleveland to Portsmouth), to a connection with the Beaver division of the Pennsylvania Main Line Canal near Newcastle, Pennsylvania. The Odd Fellows Building and Opera House became apart of Kent in the summer of 1889. It was built by the Odd Fellows Building Company for $20,000. The first show held at the Opera House was Harry Lindley in "The Stowaways” and seats only cost 25, 35 and 50 cents. As Kent grew into a bustling transportation town, a need grew for a new bridge arose. The original bridge on Main Street spanning the banks of the Cuyahoga River was a worn out, two lane covered bridge.